Daughter of the world-renowned heroes, Paramount and Glimmer, Borealis grew up surrounded by the super heroic culture of Valor, overshadowed by the great heroes above her. With her parents both key players in the development and safeguarding of the super virus cure, the young heroine feels more pressure in finding her own spotlight to stand under for people to know her as Borealis rather than Paramount’s daughter. In trying to break away from her family’s fame, she places undue strain on herself to be better and better while trying to stand out among the others in Valor. Borealis inherited abilities from her parents, Paramount’s natural longevity and Glimmer's ability to tap into electromagnetic fields from her I-sequence genes. Like her father, Borealis’ quick healing allows her to push her physical conditioning far beyond normal levels. Because of this, she has a very impressive physique that can take and deal out punishment. Her DNA profile suggests, Borealis bears the same longevity of her father, but she is too young for her body to begin preserving her age. While she inherited most of Glimmer's energy manipulation, she lacks the precision control her late mother had over electricity. What she lacks in finesse and control, she makes up for in raw power. Instead of unleashing electricity in blasts or finely tuned jolts for suppression or healing, her body internalizes it like a bioelectric battery. She can unleash devastating electric attacks through her extremities, but quickly burns out if unfettered. She uses special gauntlets and rocket boots to channel her bioenergy into punishing body blows and allow her to fly. Her signature move is what she calls the “Borealis Blitz,” an extremely fast, rocket propelled dive kick from the air which blows through enemies in a straight line. In a pinch, Borealis decides the best defense is a good offense. She’ll go into what she calls “Aurora Overdrive,” which she channels more of her bioenergy into her attacks than usual. While in overdrive, she taxes her body by forcing energy behind her feet and hands to deliver massively damaging attacks, which taxes her body’s natural healing ability, leaving her more vulnerable to receiving attacks. However, a Borealis Blitz while in overdrive has reportedly punched holes through steel barriers and shattered nearby glass. Borealis maintains careful levels of boorishness and abrasiveness as to not show any weakness to the people around her. However, this is not a front she puts up for others, but rather amplified by a need to stand out from her parents. She is impatient and headstrong who prefers coming up with brilliant plans on the fly. Of course, they seem far more brilliant when they’re working. She hates to be wrong or beaten in anything as she wants to be the best to maintain her validation over her parents. Aura grew up the child of two of the best known superstar heroes to ever walk the earth since they were both key in curing the super virus and saving humanity from the brink of disaster. She had the unique upbringing of public heroes fighting crime and global injustice for a living. When she started practicing with her inherited super abilities at the age of six, joining the ranks with her parents became only a matter of time. Despite being the daughter of famous parents, she struggled to fit in at school. 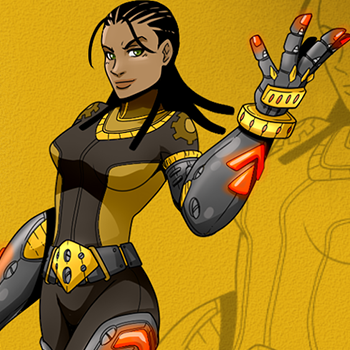 Unlike the growing population of I-sequence children hiding their abilities, Aura made no effort to mask her powers. The other children were either jealous or scared of her, especially I-sequencers who feared revealing themselves. Instead of being bitter about being an outcast, she channeled her frustration into her training to become a better hero to earn the respect of those around her. The stigma remained tied to her, which only worsened as her powers began to mature with puberty. She began strength training as well and she quickly outclassed everyone in terms of strength and stamina. Though her powers opened up many opportunities for her to perform, she was soon banned from most events due to her super powers and was exempt from any PE with her activities as Borealis. By the time she was in high school, she could be seen quickly flying to and from school with her rocket boots as she had no reason to stay. Her lonely lifestyle changed when she met Cyren. Initially agitated and hostile towards the cyborg, her unabashed gleeful cheer rubbed off on Aura and the two became best friends, the first real friend Aura had in a long time. The two began fighting petty crimes in the city, and soon gained traction after their first big job of thwarting an illicit bioenhacment ring run by the Los Rojos. After graduating high school, Aura decided to formally join Valor as Borealis full-time despite Paramounts wishes for her to attend a college. She became the youngest person to ever join Valor at the age of seventeen along with Cyren and the two serve with the world’s finest while trying to leave their own unique mark as two of the greatest heroes to ever live. Quotes "Alright, pal! Time to take my fist in your face!" "The longer we wait, big what’s-his-face with the ion cannon is gonna off someone with that thing. If you aren’t gonna do something, I will!" "You. Do. Not. Hurt. My. Friends!"